ArenaChicks.com » Blog Archive » Special ArenaChicks appearance by Cookie! Special ArenaChicks appearance by Cookie! ArenaChicks.com is proud to announce a special appearance by Cookie on Friday, April 22nd in Jacksonville, NC! Cookie, who appears on worldwide television for TNA Wrestling, will appear for ArenaChicks as a celebrity guest bartender. See Cookie at Lucky’s Tavern on Friday, April 22 from 10pm-until. Cookie will be available for autographs & photo ops during this time. 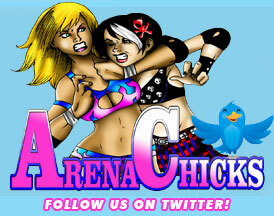 If you are interested in appearances by the ArenaChicks be sure to e-mail us with your requests!